Since about 1980, an important paradigm has emerged in the geosciences, analogous to the plate tectonics revolution of the 1950s and 1960s. This paradigm, called "Earth System Science" or simply "Earth System," acknowledges that changes in the solid earth (land - lithosphere or geosphere) result from interactions among the atmosphere (air), hydrosphere (water, including oceans, rivers, ice), biosphere (life) and the lithosphere. (In these Starting Point pages, two additional elements are also included. These are the human dimension (or anthroposphere) and the solar system and interplanetary space (or exosphere)). A good example is the increasing awareness of the role of microbes in generating ore deposits. Another example is the way tectonics influences weathering rates, which in turn affect global climate. Earth System Science also includes studies of the ways energy and materials cycle through the different "-spheres" as well as the workings of climate and the biosphere. Solid earth geoscientists will be familiar with "The Rock Cycle" which appears in almost every introductory geology book. Earth system science, by contrast, shows how elements like carbon or energy sources like solar radiation cycle through the lithosphere and all of the other "-spheres." 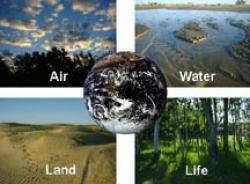 The Starting Point site offers several resources to get started in Earth System Science. Earth System Science in a Nutshell systematically introduces concepts and resources centered on space, air, water, land, life, and human dimensions. Designing an Earth System Course presents several examples of Earth System Science courses with different emphases, each based on a matrix approach that systematically looks at interactions among the different "-spheres" within a particular content area. To the "spheres" listed in the previous paragraph, this course design site adds an "anthroposphere" to highlight the major changes humans have produced on the earth and an "exosphere" to highlight the interactions of space (especially the solar system) with earth history and processes. Introductory geoscience courses can be modified or transformed in several ways to incorporate an Earth System approach. As a teacher, you may a) choose to include in your introductory geoscience course a few new topics and exercises related to the earth system or stress the earth system thinking underlying such basic topics as the rock cycle and plate tectonics; b) change the focus of a major part of the course (for instance, to include a section on climate change); or c) completely transform the course into an Earth System approach. You can start small and increase the Earth System focus as your comfort level with this approach increases. These Starting Point pages have helpful suggestions for instructors at all levels of familiarity with Earth System Science.